There is a new blog carnival called Festival of Postcards. The instructions for the premiere issue are to choose one postcard that touches in some way on the topic of Wheels. Anything with vehicles, bicycles etc. is fine but you can also be creative with this theme. The ideal post will contain the front and back of the postcard, its size and any other information you might have. 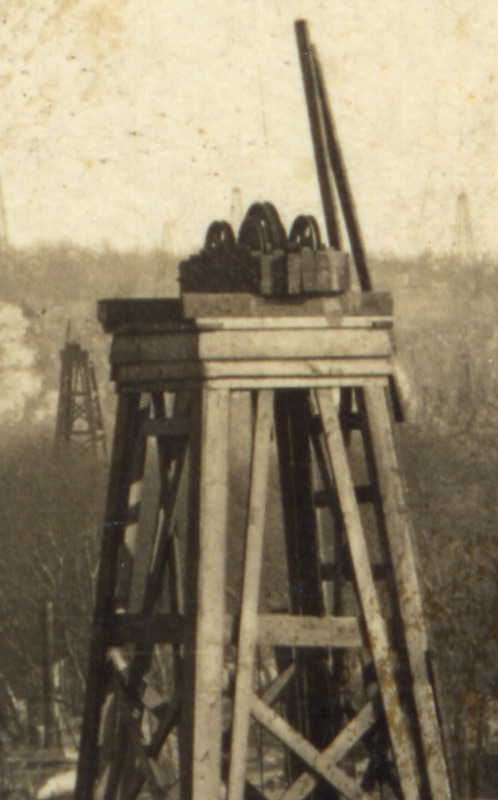 Among my grandmother’s things is this postcard showing the huge number of derricks that lined the Cimarron River near Oilton, Oklahoma between 1915 and the mid 1920’s. The 3.5″ x 5.5″ postcard had some adhesive used on the back of it at some point although it is not sticky at all now. You can still see the message on the back though the card was not ever mailed. 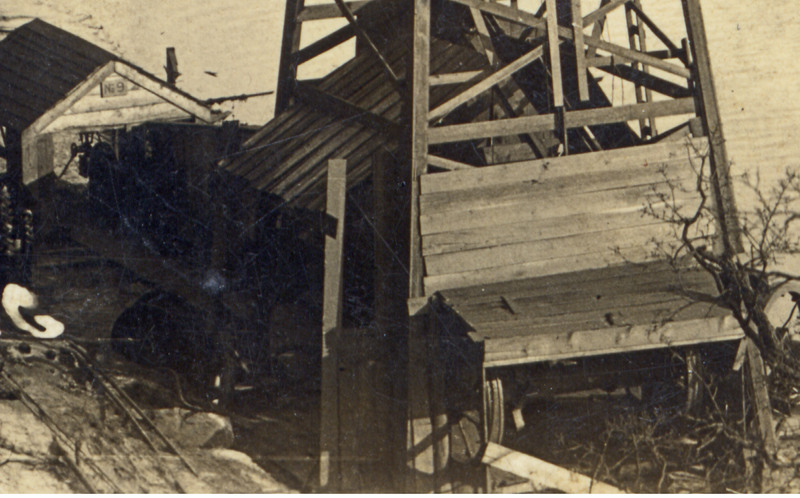 At first glance you may not notice the relevance to the topic of wheels but upon close inspection you can see wheels at the base of the derricks, the tops of the derricks plus a wagon and more. 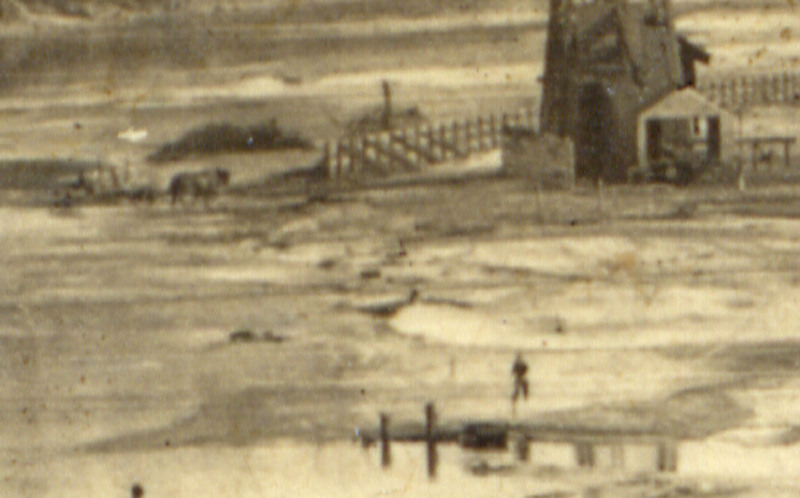 I’ve cropped those portions so that you can see them more clearly. 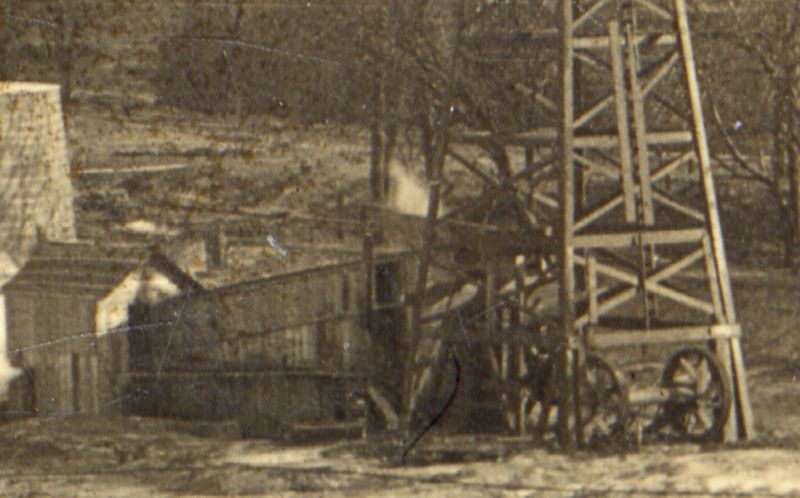 Oilton is in Creek County south of the Cimarron River and was established in May 1915 as part of the oil boom. “Oilton was eight miles north of Drumright, in Creek County, and this was where all the excitement was. It was also where all the ‘gushers’ were – the whole eight miles from Oilton to Drumright was to be made into a mass of oil wells!” (Ruth Alexander) Apparently, the mist from the oil sprayed on children as they walked to school, on the vegetable gardens and left oil in the river. 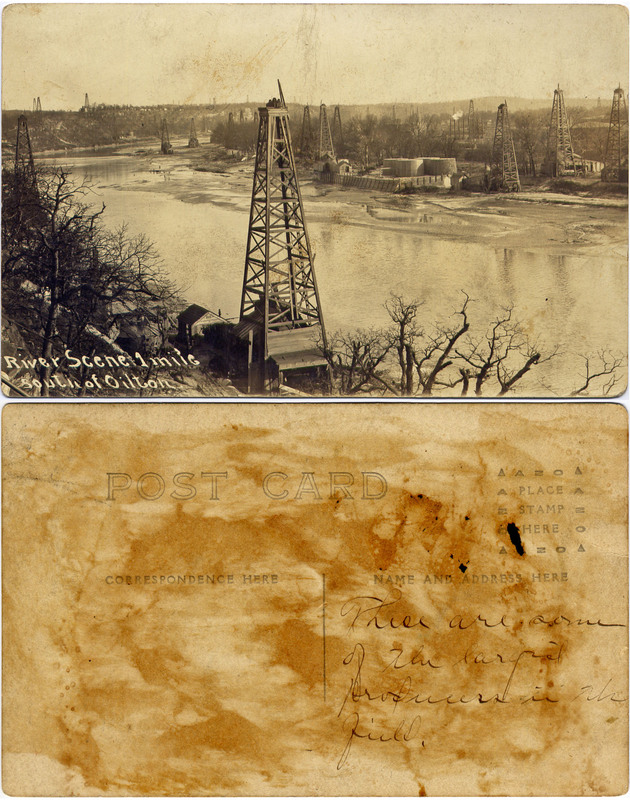 It is very clear by looking at this postcard that the area was inundated with derricks. So, what’s my family’s connection with this postcard and why would my grandmother have kept it? My great grandparents, Jacob Lineberry and Eva Keithley, married in Oklahoma and were living in Capitol Hill, Oklahoma with their 7 children, ages 13 years to 19 months, by October 31, 1915 when Jacob died. Eva was 32 years old and did not live near any family so I imagine trying to raise 7 kids alone was a frightening prospect. Within the year she married James Fox, who had worked as a carpenter with Jacob. By June 1917, Eva and Mr. Fox welcomed their first child together and the family was living in Oilton, Okahoma. Clearly, my great grandmother, her children and her new husband were living in Oilton as early as 2 years after it was established as a town. We do not know what brought the family to Oilton but it was likely the hope to make good money. Mr. Fox, was an oilfield worker for some of the time there and also worked as a carpenter helping build local hotels and such. The family lived in Oilton until Eva’s death in January 1922 when the youngest 5 children were sent to Virginia to live with relatives. You did a great job with this post, Kay. Am glad you cropped the wheels so we could enlarge the clips and actually see them! Can you imagine that scene today in this eco-friendly environment? Thank you for telling Jacob and Eva’s story here. 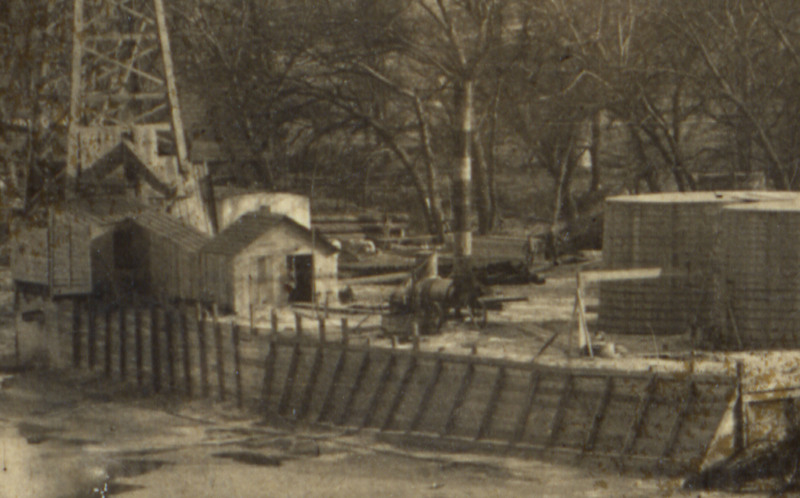 There are photos of the area today and you would not know that it ever looked like this postcard shows us. I’ve looked at this postcard for years and really never knew that much about it so I enjoyed this opportunity. Thanks for stopping by and letting me know. It’s so interesting to be able to tie in industrial heritage with family history. A fascinating post, thank you for sharing it with us. Thank you for stopping by Sheila and for sharing your feedback. I enjoyed learning about Oilton. This is very interesting. My fathers family is from Oilton OK. I have started a project with him to do our family tree on his side. I am getting a late start he is 75 and the youngest of 11. Thank you for your work. Wow, if your father is the youngest of 11 and they all were from that area, your father probably holds quite a bit of history of Oilton.